100% Hand-dyed Skinny lace weight merino wool is cute AND fabulous! 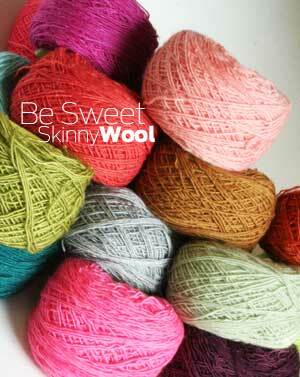 - ultra soft lace weight pure merino wool in Be Sweet's fabulous color palette! If we don't have enough in stock, or you would like to special order a color we don't normally stock, please use our Special Order Button! Out of stock? Need a certain color? Special order it here! 4 balls, 2 balls of 2 colors. Free Download with any SkinnyWool Order!